The material materials are always around us begging for recycling! It requires the genius ideas always to regain those retired objects into functional objects! 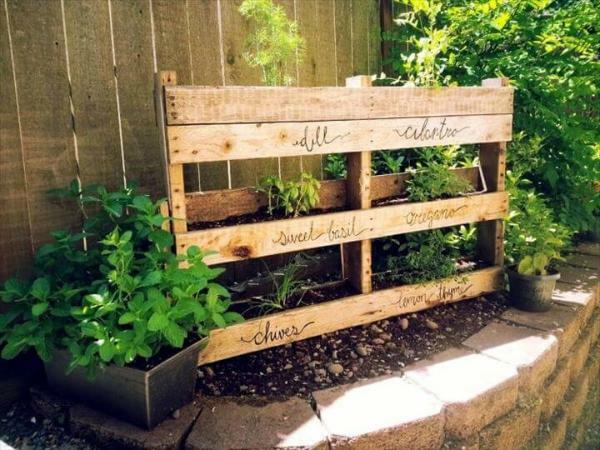 We have shared a big collection of these DIY wood pallet ideas that will let you go genius with old pallets lying useless in surroundings! These pallet ideas are all special for those who just love to be creative and to work with those own hands! 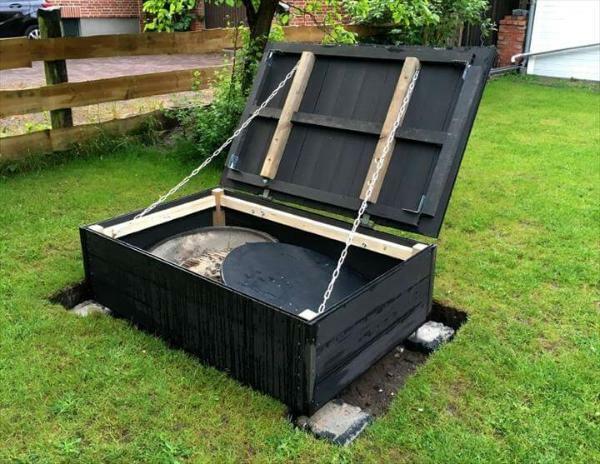 Make sure of one thing, these ideas are not about just giving a 2nd chance to those thrown away pallets but also about the low-cost ever home improvements you can do with pallets! 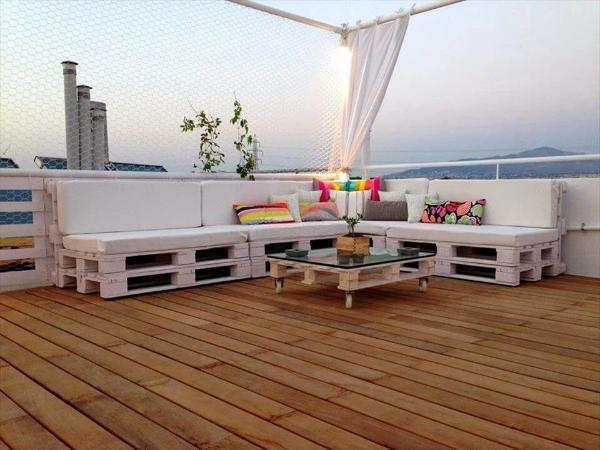 By bringing the whole pallet boards in custom L-shapes, you can simply add cushions to them for amusing sofas or occasional sitting plans for your lower and higher level patios! 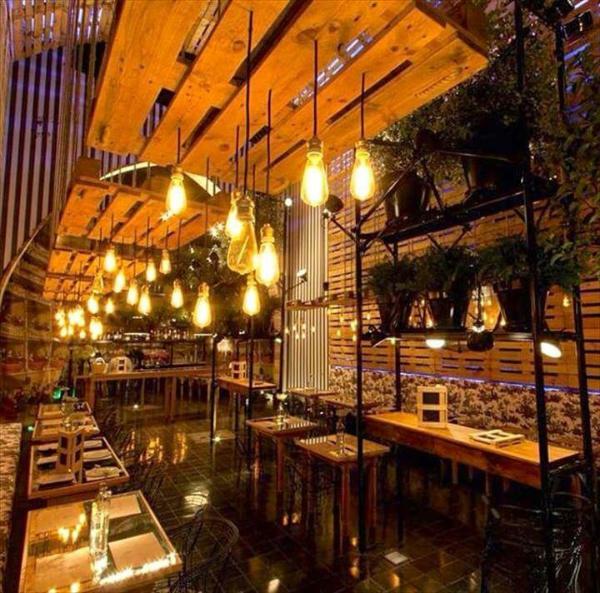 Organize your bars, pubs and even the restaurants with pallet-made furniture that costs you nothing an is always long living, also install some lights to pallet boards and let them hang on aloft supports for beautiful chandeliers or pendant lights for your shops and restaurants! 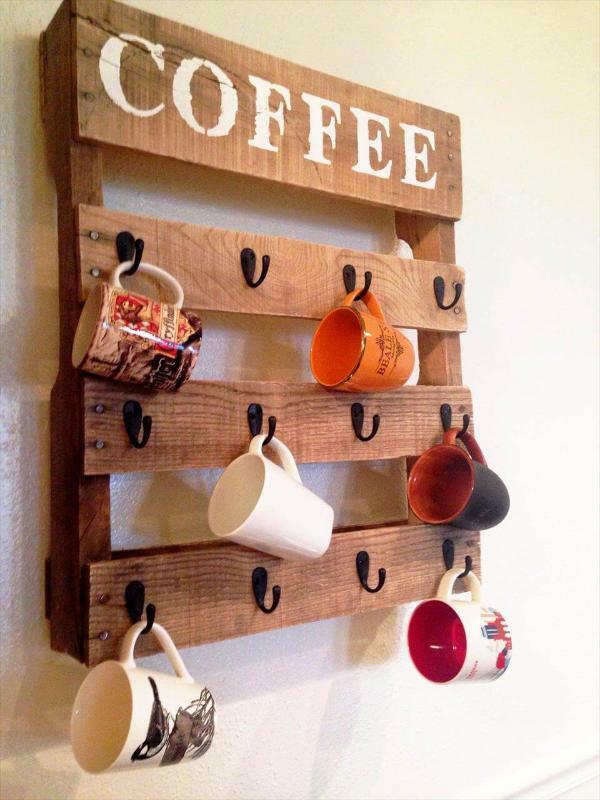 Add custom hooks to a modified pallet board and build a stylish coffee mug rack out of it which can even hang flat like a accent on your kitchen wall! 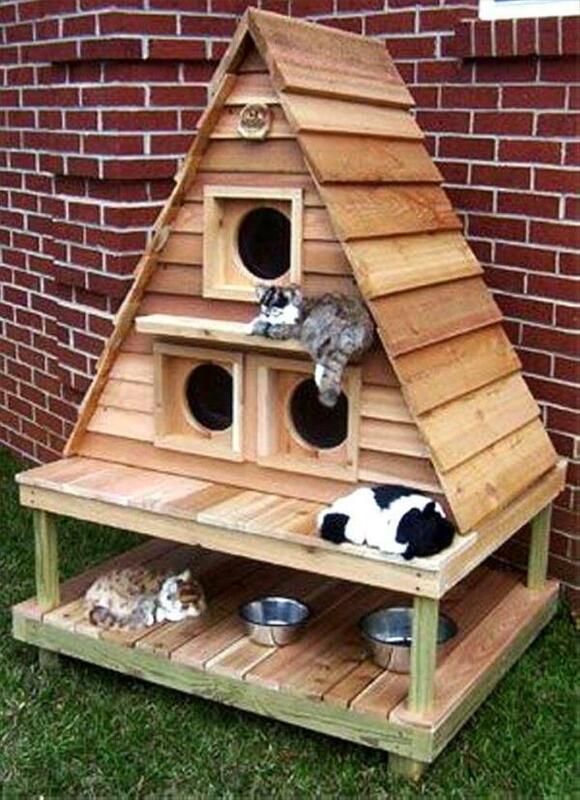 Recover amazing chests out of pallets and also restore pallets into multi-story cat houses inspired of modern houses as shown below! Hire pallet for building low-cost sitting furniture like the beefy cushioned chair and also grab them for custom interior developments like making an accent pallet wall over the fireplace mantle! 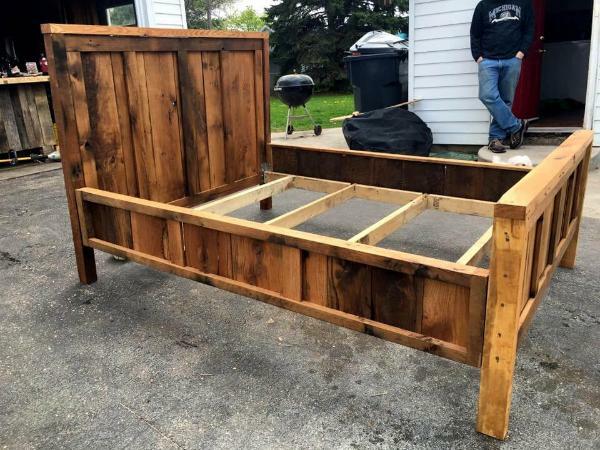 Build amazing wooden beds, the raised garden flower beds and also stylish wall organizers out of pallets! 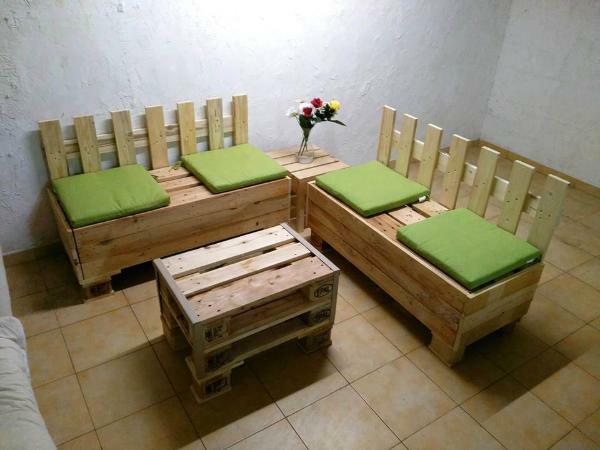 Get benefited by the already made geometrical shapes of pallets, just arrange them in particular way so you can get amazing sofas and seats to organize your spaces, learn a lot here from this terrace corner sofa set! 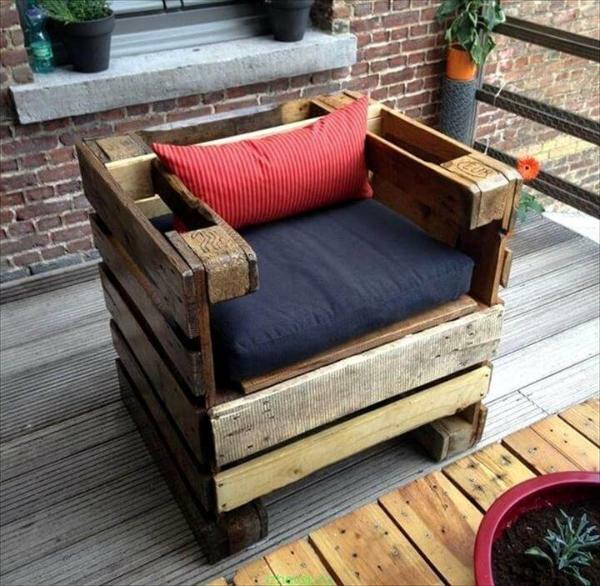 Have a look at these amazing pallet furniture ideas, done with pallets, from custom sitting plans to ceiling lights, all has been done with pallets! Add some metal hooks to a pallet board and just change it into a wall organize or even into a rack to hang your coffee mugs, checkout the practical example here! Get the ideal units to store your home items, out of pallets, get a little crafty with those old shipping skids and build all from shelves to custom storage cabinets to storage chest, see this black painted one having extra metal and wooden supports added to lid! Let your cats live the luxury, build this bungalow style house for them and ensure them a bit more security! There is additional lower shelf on which the pots can be placed to feed your cats! Sit like a boss in this extra stable model of chair, crafted with hands and is composed of rustic pallets, cushioned for an ideal feel of comfort! 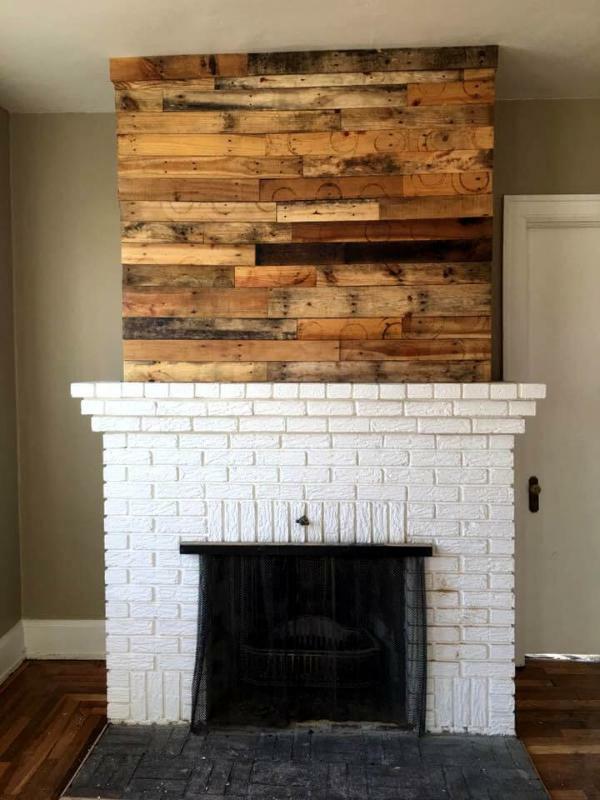 Here this mini wooden wall has been built over a fireplace mantle just for accent purposes. can be too much functional also if you install the hardware like hooks and knobs to it! Try also your hands in making stylish and featured bed out of pallets, would be a great way to lower your costs, here is a little sample about how you can do it just in a master way! 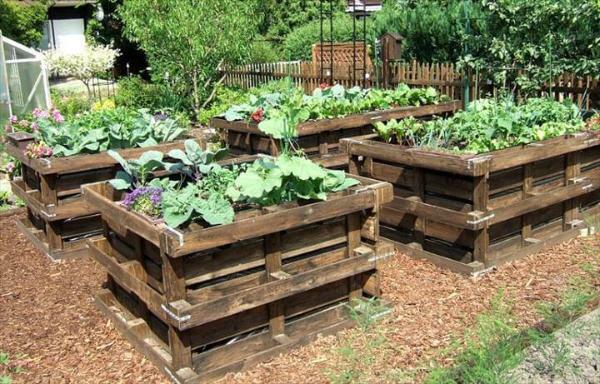 If you are only wishing for your garden to be stylish a lot, then you can do it all for free, install these free raised garden beds using rustic pallet boards, these beds also provide sit pockets which can even be filled with potting soil to use as pallet planter! Install beautiful shelves and shelving schemes also with pallets, this way recycling of pallets is all useful while willing to gain the neat and uncluttered appearance of our interior spaces! 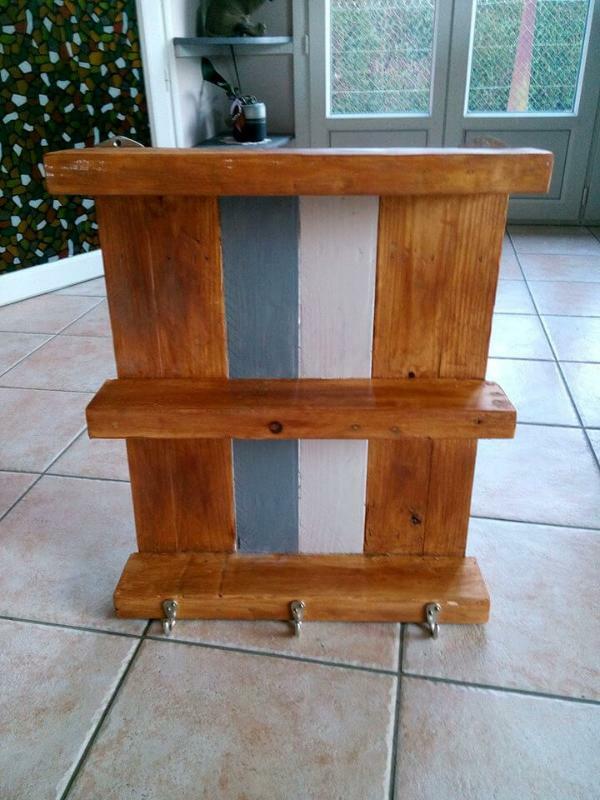 This little shelf comes with fixed hooks to bottom so would also be a stylish coat rack! Hire the pallets also for a visual boost to your garden and indoor spaces, an interesting example is to build the accent wooden frame that comes with hanging planters and you can also go with pallet and steel bucket garden building along the metal outdoor fence! 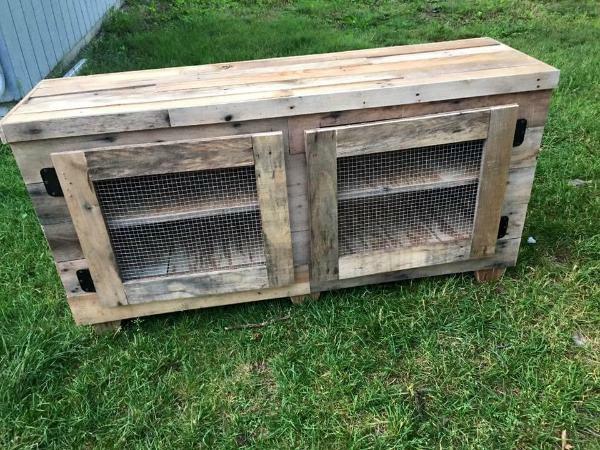 Build brand new wooden furniture with pallets and just revamp the old furniture with pallets just like this kitchen hutch made with an old window and pallets! 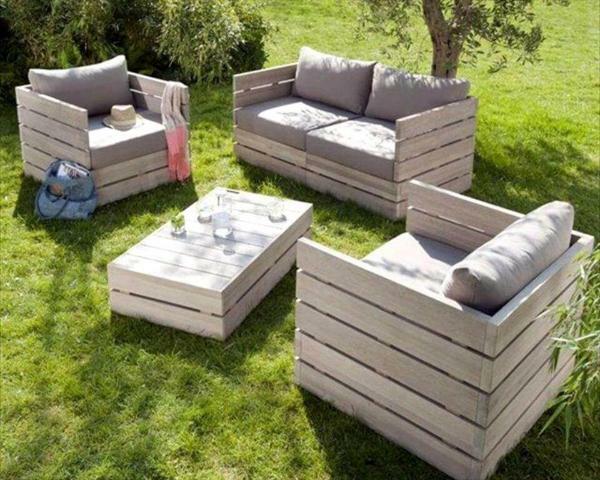 Start piling up the clone pallet sizes and build amazingly sturdy L-shape sofa or sitting sets, will lift up the mood of your paved outdoors and garden along with the comfy feel of sitting! Mix the chicken wire with pallets and get your hands onto mind-blowing crockery cabinets and pet houses like the aviaries and chicken coops! 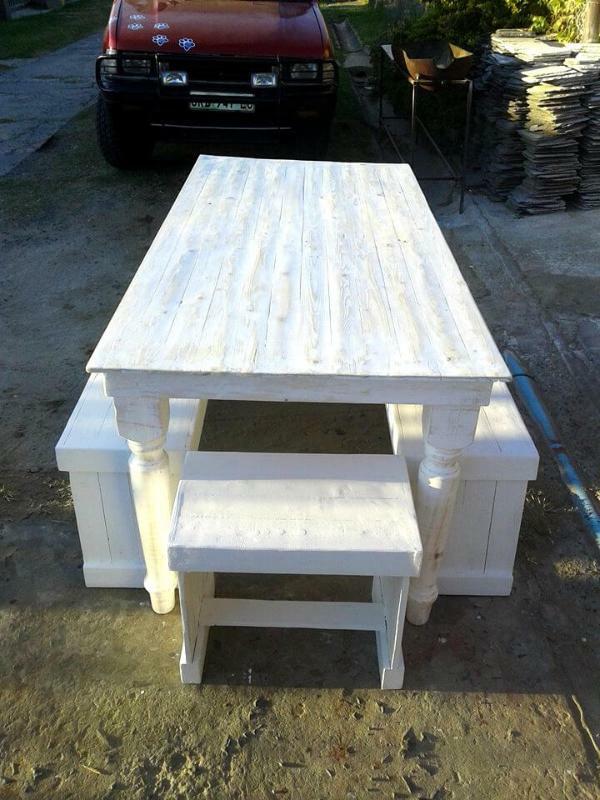 Rebuild pallets for amusing garden sitting set and do go handmade with them for stylish snack party sitting sets out of them, a white painted one long table with 2 matching benches is what here that can make you inspired! 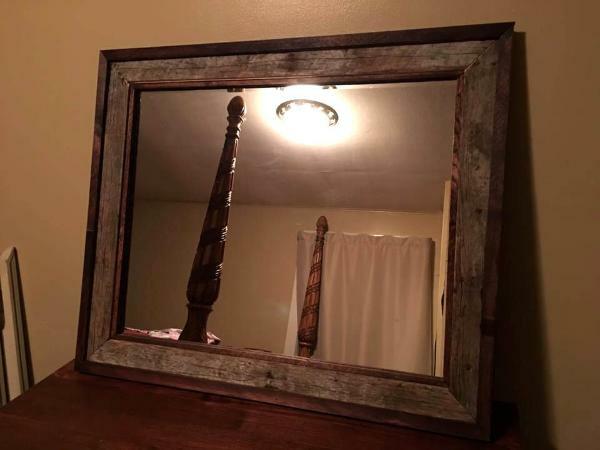 Plan the single pallet slats for lovely wall art pieces as they are too good to write over with paint, fancy up your garden by installing double chair garden bench and give your modern bathroom a glam rustic wooden touch by making amazing vanity mirror with rustic pallets, a cool sample has been given below! 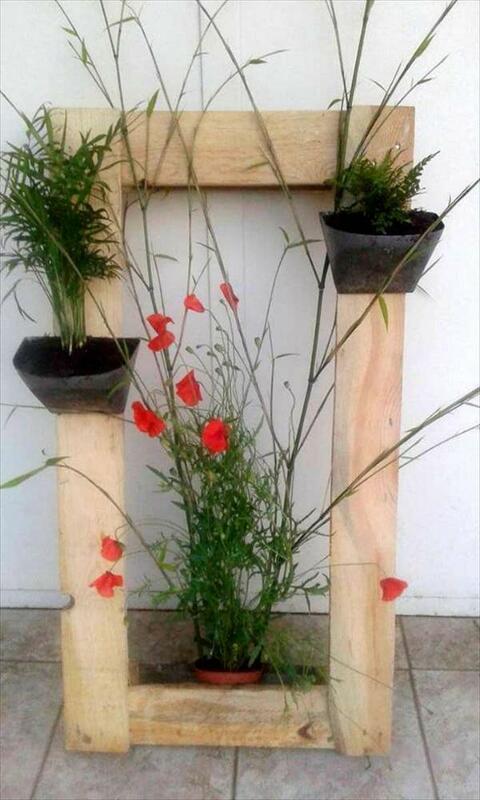 See the amazing pallet trick here to give a decorative boost to your garden, a little frame has been made using pallet slats and is having 2 mounted mini planters on each side and itself acts as an accent display frame to planter placed behind of it! 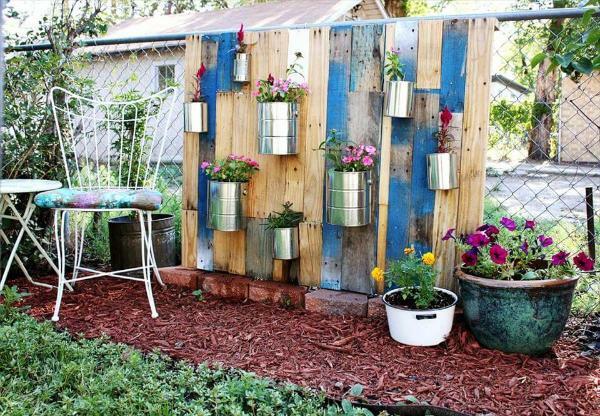 See here the most creative concept of using pallet scrap and those of tin cans or buckets! You can install a delicious vertical flower or herb garden with them, tin cans will serve as hanging pots while pallet lengths can be utilized to install the perfect wooden wall! 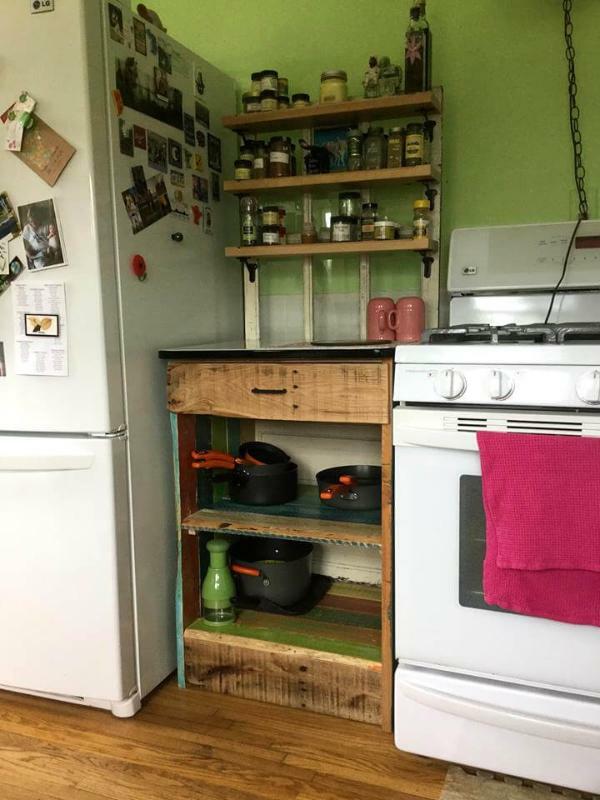 Revamp and repair your old furniture also with pallets, you can see the pallets here repairing a fab kitchen hutch design! Now it is again having better options to store the kitchen material! 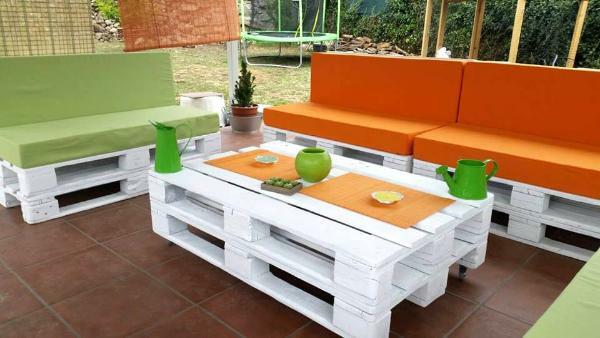 Here is what you can do easily using all original boards of pallets, a stylish sofa set painted in white and seats have been made soft to sit by providing green and orange cushion! Stack of 2 pallets also builds a special pallet coffee table! This stylish kitchen cabinet or media stand may be furniture item here which can be build quickly with pallets, it is a need of every home and here the chicken wire doors have been installed so the inside stored things would be all visible if you see from outside! 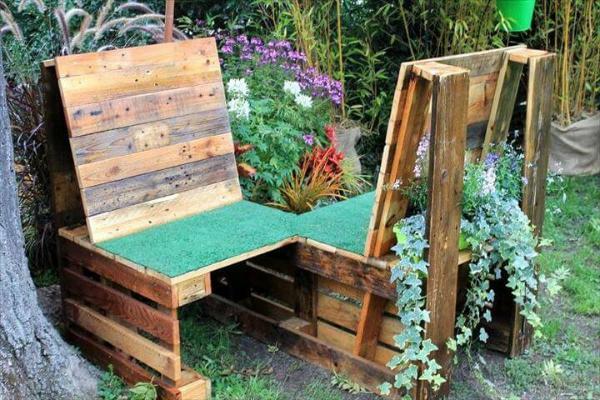 Here pallet garden furniture has been made just like the concrete ones, pallets slats have made all easier here to install the rocking and lasting-longer block style furniture construction, all a fab set for garden sitting and parties! 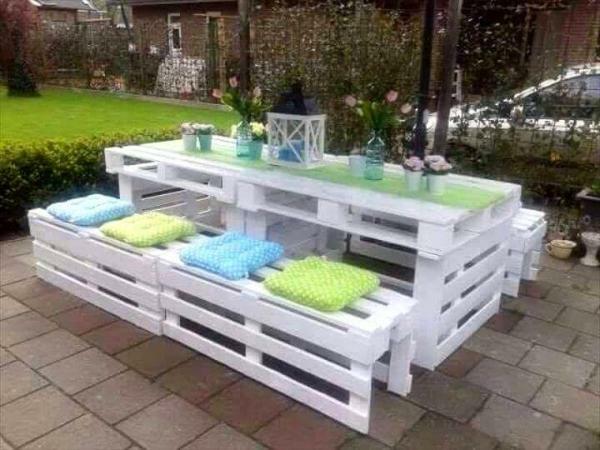 This XL table with two matching benches have been made with pallets just for patio picnics or garden parties, would also be amazing for amazingly family outdoor dinners! Here preference has been given to white paint which goes just all friendly to open green natural environments! 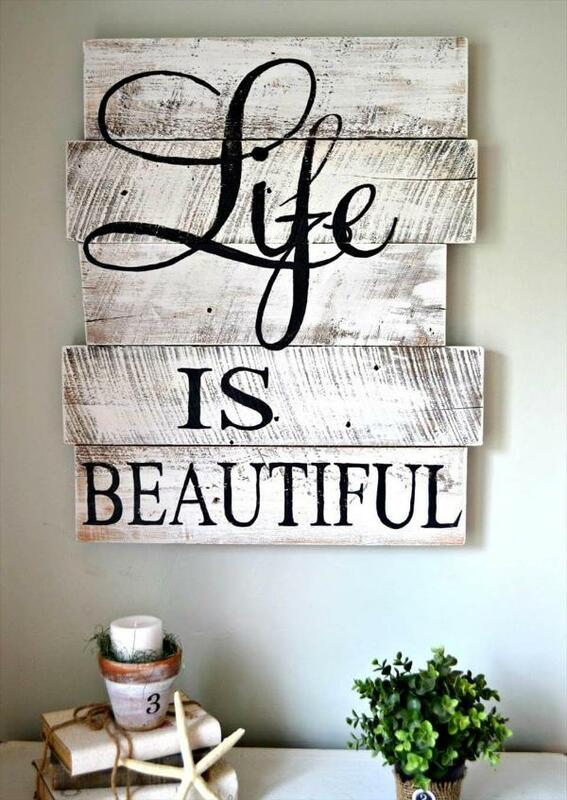 Style up your walls also with fancy pallet-made decors and wall art pieces, here few pallet wall art ideas have been turned into an all eye-captivating piece of wall art, custom letters have been written over in black! Again marvelous sitting pallet furniture set for your paved outdoors, living room or higher level patios, also contains a corner accent table along with a central coffee table, both have been installed with pallets! Here an all unique wooden pallet bench, the pallet double chair bench, looks as two chairs facing each other, here back of the chair has been modified to gain a planter holder out of it! Green pieces of carpet has been spared over the seats that makes the bench a perfect match to surrounding garden greenery! Here a full but altered size of pallet have been regained as a herb garden, already built section in the pallets have been changed into little holding which carry the potting soil and are serving here as planter, the names of the herbs have also been displayed over this wooden herb garden! Dining table here is having reclaimed legs and a top has all been made of pallets! Then matching seats and benches have been made to gain a full dining set for outdoor dinners and parties for free! Let your modern bathroom interior gain a fab vintage touch by hanging this stylish rustic wooden mirror on a particular modern bathroom wall, here the rustic boundary all around the mirror has been completed pallet slats only!